Peel and devein the prawns. Place in a bowl with mango and avocado. Combine in a screw top jar the grated zest of 1 lime, juice of 2 limes, coriander, chilli and honey if using, salt, pepper and oil. Secure lid tightly and shake until well combined. 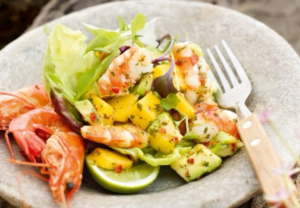 Pour over prawn, mango and avocado mixture and toss to combine. Spread washed lettuces leaves onto a flat serving dish, top with prawn mixture, garnish with pea shoots and lime wedges.